MISHAWAKA, Ind. – Grace’s men’s basketball team faced a 17-point deficit in the second half of the Crossroads League Tournament championship game against Bethel, but the Lancers nearly pulled off a comeback for the ages. The Lancers cut the gap to one possession late in the game, but the Pilots sank 7-of-8 from the free throw line in the final two minutes to hold on for a 70-65 victory. The loss eliminates Grace from contention to the NAIA National Championships, shifting the Lancers’ attention to the NCCAA National Championships from March 19-22 at Grace College. Niko Read made several key plays late in the tournament championship to bring the Lancers back into striking distance. 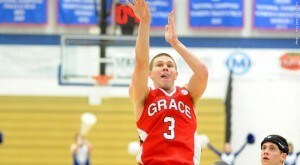 He led Grace in scoring with 15 points, including 12 in the second half. Tuesday’s championship shifted to Bethel’s favor midway into the first half. The Pilots grew a two-point lead into 15 with four minutes left. Bethel’s strong outside shooting (7-of-13 from 3-point line) propelled the home team’s offense as the Pilots grabbed a 41-28 lead at the half. Grace struggled to 12-of-33 shooting from the floor (36 percent) before halftime. Grace’s offensive woes continued through the first 10 minutes of the second half. The Pilots opened up their largest lead of the game at 55-38 with 11:45 remaining. Brandon Vanderhegghen helped spark Grace’s rally with seven points in six minutes, and Niko Read carried the scoring load down the stretch. The Lancers outscored the Pilots 27-15 over the final 11 minutes of the game, including a crucial 14-5 spurt. Grace’s defense also clamped down on Bethel in the second half, limiting the Pilots to 31 percent shooting after halftime. In the final 6:06, Read buried two 3-pointers, converted an old-fashioned 3-point play, and made 3-of-3 from the free throw line. Read’s three free throws came with 17 seconds on the clock when he was fouled on a 3-point attempt. After making all three shots, Grace trailed by just two at 67-65, but Bethel made three free throws over their next two possessions to win by five. Jared Treadway made 5-of-5 from the field for 11 points and also hauled in nine rebounds. Greg Miller grabbed a game-best 11 rebounds to go along with seven points, Logan Irwin added 14 points, 9 boards and 3 assists, and Vanderhegghen added nine points off the bench. The tournament field for the 2014 NCCAA National Championships will be revealed the week of the tournament. All games will be played at the Manahan Orthopaedic Capital Center. This story first appeared on the Grace College Sports Information page.